Requires the NVIDIA PhysX Legacy System Software. Multiplayer master server is offline. 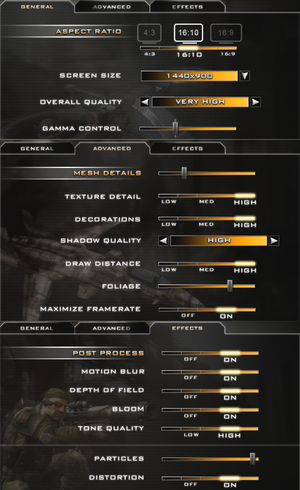 Use Frontlines: Fuel of War Aspect Ratio Fixer. The game re-adds the border as soon as its removed. Window has maximum size, and can't be repositioned higher than Y=0. Disabled by default. See Vertical sync (Vsync). Under [Engine.Console] look for ConsoleKey=None and replace with ConsoleKey=Tilde. Add the line -devmode to the game's shortcut. In the game, press ~ to bring up the console and type fov x. Change StartupFullscreen=True to StartupFullscreen=False to launch a game in a Windowed mode. Enabled by default. Option in GCinput.ini, bEnableMouseSmoothing=false. Cannot disable vibration when using keyboard and mouse. Enabled by default. No option to disable it. 64 Possible to connect over IP via console. Open the console and enter open followed by the IP and port. The game includes an outdated version of openal32.dll which may crash the game. Rename openal32.dll to a backup name. 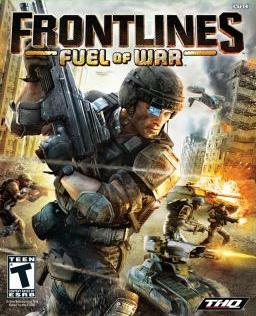 This game needs an older PhysX version no longer included in the latest PhysX System Software. PhysX Requires the NVIDIA PhysX Legacy System Software. ↑ 1.0 1.1 File/folder structure within this directory reflects the path(s) listed for Windows and/or Steam game data (use Wine regedit to access Windows registry paths). Games with Steam Cloud support may store data in ~/.steam/steam/userdata/<user-id>/9460/ in addition to or instead of this directory. The app ID (9460) may differ in some cases. Treat backslashes as forward slashes. See the glossary page for details. This page was last edited on 31 March 2019, at 09:58.